Skippy looked over Wendy Barrie’s shoulder as she studied her part in It’s A Small World. The pretty little English actress looked around quickly and caught him at it. Skippy wiggled his stumpy little tail and hid his head between his paws. He looked so embarrassed that Miss Barrie had to laugh: She tousled his coat and patted his cold little nose. “All right, Skippy! I’m not jealous. 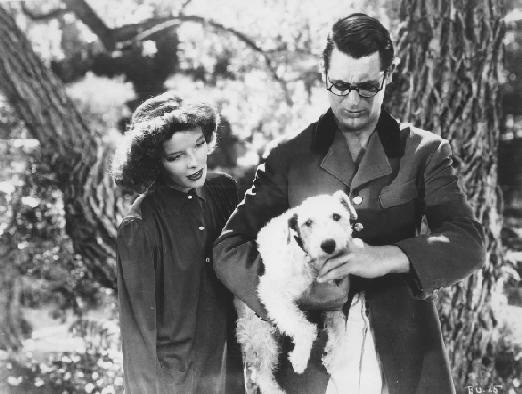 If you will be as cute as you were in The Thin Man, you can have the scene,” she promised him. 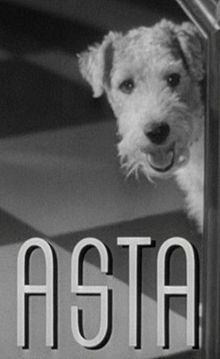 Skippy is a bright-eyed little wire-haired terrier who leaped into fame over night when he appeared with Myrna Loy and William Powell in Metro’s recent picture, The Thin Man. He made such a hit with his cute antics and the way in which he helped Powell uncover the murder by digging in the ground at the place where a body had been buried, that he has been working steadily ever since. Skippy is four and a half years old now. His training began when he was three months old. In one month he had learned to sit up, lied down, to speak, and best of all, to come when called. He learned so fast and so easily that Henry East, his owner, who has been training dogs for the last twenty years, knew that he had a winner in this pup. Dogs are like people. Some are smarter than others. Some are born to be stars an some are just dogs all their lives. Any trainer who has handled them can tell whether or not he has a star or just another lovable animal on his hands. All dogs can be taught obedience and manners. That is the dog kindergarten. Skippy learned his first lessons in obedience at the end of a ten-foot training leash. As the trainer gave the command, “Come here, Skip,” he would gently pull the dog towards him just as one would pull in a little fish. When the pup was at his trainer’s feet, East would pet him and praise him for being a good dog. As an additional reward Skippy would get a bit of dog biscuit. After a dozen lessons like this, the pup would come tearing at his master’s call. Learning to sit up was the next step. Mr. Skippy was placed with his back to a corner and lifted into position. “Sit up! Hold it!” the trainer would say, as he showed the dog just what he wanted him to do. Skippy’s intelligence was expanding now with each lesson. He was taught to sit, to crawl, to pick up an object and not only associate the action with the word, but also with a gesture of the hand. This was the most important part of his schooling for the screen, for a picture dog has to work with silent signals or “cues”. The sound track of a picture records everything that is said while a scene is being made. The human actors must be letter perfect in their parts. Dog actors must learn to work through a routine with only a few rehearsals and silent cues from the trainer standing near. Sometimes it is necessary to give spoken commands which afterwards can be cut out of the sound track in the film cutting-room. But the real dog stars are too smart to need this. By the time he was a year old Skippy had made his way through dog college and won his diploma. His master declared that the dog was ready for serious work. To give him experience, he put Skippy in several pictures just as background or “atmosphere”, as they call it in the studios. In this way he became accustomed to working under the strong lights. His big moment came when he was signed for a featured role in The Thin Man. One of the dog’s cutest tricks had been taught him by Jack Weatherwax, a trainer with Mr. East. Jack noticed that, when Skippy’s ears itched, he had a funny little habit of rubbing them on the floor or ground. Keeping his head down on the ground, with his hind legs he would walk around in a circle. Every time he did this, it made observers laugh. So every time Skippy put his head down to scratch his ears, Jack would shout, “That’s right, Skippy, go crazy!” Soon the dog associated the command with the action and when given the signal would go through the act. 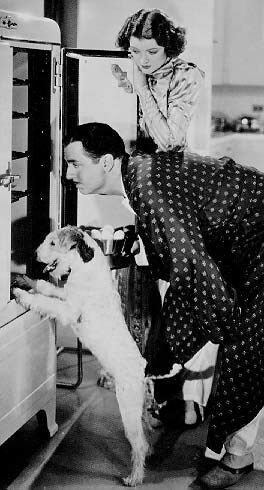 During the making of The Thin Man the director wanted the dog to do some new trick which would show what he thought of as a noisy party going on in the living-room. Skippy was told to go to the door and look out at the party. Then he was to run under the bed and go crazy like the other actors. He looked so cute, that the shot got one of the biggest laughs in the picture. William Powell became so attached to Skippy, while they were making the picture together, that he offered his trainer a big sum for him. East refused to sell him but trained and presented a clever little dachshund, Jerry, to Mr. Powell instead.